The Sunday Washington Post article on Howard University Hospital, which described a once-grand institution fallen on hard times, struck close to home for me. That’s because I had an unexpected visit to Howard’s emergency room two days earlier. My medical emergency wasn’t life threatening, but the pain I was experiencing after busting my ankle on campus was overwhelming, so I was grateful when the paramedics said they were taking me to Howard Hospital, which was literally two blocks away. The lengthy Post article described large malpractice awards, accreditation troubles, staff retention issues and health inspection deficiencies. It depicted the emergency room as problematic, with inadequate staffing, inoperable equipment and some of the longest wait times in the city. My experience reflects just one of the 60,000 patients that come through Howard’s emergency room each year, but truth be told, the facts of my visit tracked pretty closely with The Post’s report in a few key areas. After being wheeled into the ER, I joined a line of about four stretchers waiting to be checked in. Throbbing pain radiated from my ankle, shooting down to my toes and all the way up to my knee. I was pretty sure I had broken something. As my stretcher inched its way to the check-in desk, I asked if I could get something for pain but was told I had to wait until I was checked in. The Post reported that patients with broken bones waited an average of 101 minutes before getting pain medication. I shivered uncontrollably, and my daughter, who met the ambulance at the hospital, found an attendant, who brought me a thin, dingy blanket. As the minutes ticked away, I moved up to the front of the line. And then sat. My information popped up on the attendant’s screen soon after that, and a minute later, he brought me a Percocet and small cup of water. Total wait time for pain medication: Less than 20 minutes. So far, so good. According to The Post, “city health regulators have documented dozens of problems, including little oversight of medical residents, inoperable emergency room equipment, sloppy record-keeping and a lax nursing staff.” A former employee told the paper that it wasn’t unusual for patients to be left in the hallways or on gurneys. As the drug began to take effect, I found myself in a wheelchair being taken for X-rays. The short ride ended with me being parked in a nondescript hallway outside an open door, where I heard a voice say, “It’s going to be a while,” as the attendant who had been pushing me disappeared around the corner without a word. Luckily, my daughter, who had been filling out paperwork, found me sitting there and went in search of that voice to find out what exactly “a while” meant. No matter what hospital you find yourself in, experts will tell you that every patient needs somebody there with them, an advocate who can communicate with the nursing staff and let them know someone cares–and is watching. A kind-hearted tech explained to us that one of the three main X-ray suites was down, and had been for almost a week. Another wasn’t suitable for examining extremities like legs and feet. That left just one machine, and there were several other patients ahead of me. “I keep telling them in emergency to stop sending people back here, because there’s nowhere for them to wait,” he said apologetically. My wait time could be a couple of hours, he warned, but it was really hard to say. He must have seen something in my face because he went away, then came back with an idea. He managed to position my wheelchair so I could get X-rayed without having to lie on a table. My wait time: Less than 20 minutes. Back in the ER, I was wheeled into a very small, shabby waiting room with a young mother and her two small children–one of whom was obviously sick. One intake desk staffer brusquely told my daughter she wasn’t allowed to wait there with me, and sent her out to the general waiting area. She inadvertently left my purse on a table near the desk. A few minutes later, an attendant spotted it. I heard him ask the desk crew about the unattended purse. None of them seemed interested. Time passed slowly in the tiny room as the child coughed noisily without covering her mouth and I tried not to inhale. The attendant asked again, “Whose purse is this?” I couldn’t see it, but finally, it occurred to me that it might be mine. I managed to get his attention from my wheelchair. After gently questioning me to make sure I was the rightful owner, he brought my purse over, cash and credit cards intact. Another small act of persistence—and, ultimately, kindness. About 30 minutes later, the doctor—a slight, serious man—appeared. He took me to a nearby examination room, but had to go find clean sheets for the table before I could hobble onto it. He spent all of two minutes examining my ankle and foot, then returned 15 minutes later with the good news—no broken bones in the X-rays. I was on my way home! 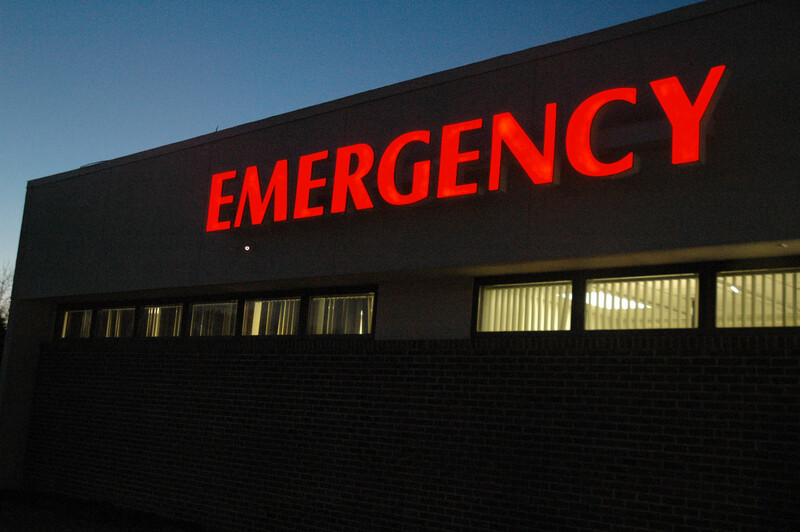 The average wait time for a patient visiting Howard’s emergency department before being seen by a health-care professional is 113 minutes, the article said, the highest among D.C. hospitals. My time from arrival to doctor exam was about 130 minutes. In the federal government’s star rating system, The Post reported, Howard was one of several city hospitals that scored one star out of five, based on patient interaction with medical professionals. In my experience, for every great guy in radiology, who was pleasant, professional and went the extra mile, there seemed to be an aide with an attitude in intake, unhelpful and inefficient. That can’t help but influence patients’ feelings about the place. The Post interviewed Dr. Robert L. DeWitty Jr., a surgeon who said he reluctantly left the hospital in 2015 after 30 years out of frustration. I heard a similar frustration in the X-ray tech, who said he’s thinking about retiring after nearly 20 years. Howard University Hospital needs to find a way to hold on to employees like that, who still make things happen, who still care, despite the mismanagement, faulty equipment and financial trouble. Employees like that make it hard to give up on this Washington institution.